Nearly 50 percent of Michigan’s land area is covered by forest vegetation, and six different species of oak trees are found growing natively in forests and planted in landscapes throughout the state. Oak trees (Quercus spp.) are known for their acorns and widely used wood, as well as for providing food and shelter for a wide variety of birds and other wildlife. Growing 60 to 80 feet tall with a 2- to 3-foot-diameter trunk, the black oak tree (Quercus velutina) has thick, leathery and shallow lobes that are widest toward the bristly tips. Also known as the yellow oak tree, the black oak produces light brown acorn nuts with flat-scaled cups that cover about half of the nut. Found growing on slopes, ridges and dry upland areas in Michigan, the black oak has yellowish to orange inner bark, which was once used as a source for yellow dyes. Slow-growing and long-living, the bur oak (Q. macrocarpa) reaches about 70 to 80 feet in height and width at maturity. The bur oak tree is found growing in a wide range of soil and moisture conditions in Michigan, but it grows best in full sunlight. This oak tree has large, 6- to 12-inch-wide leaves with five to nine lobes separated by deep sinuses. The bur oak produces large acorns with fringed caps that cover about half of the nut. 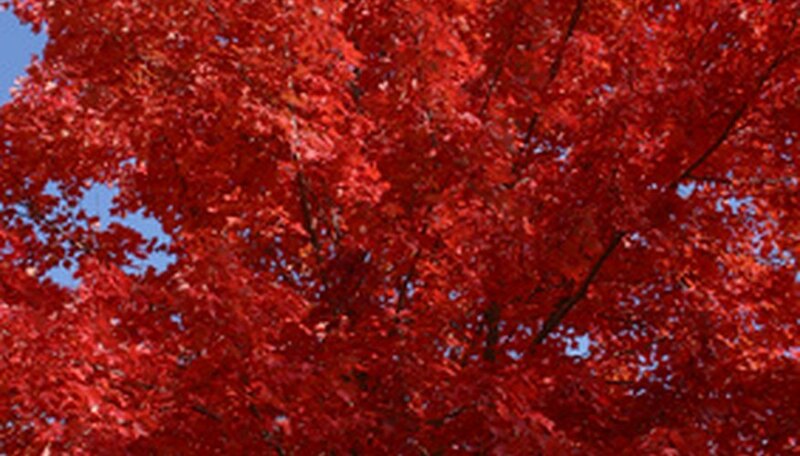 Reaching a mature height of 45 to 75 feet and spread of 45 feet, the Northern red oak (Q. rubra) is often grown in urban environments throughout Michigan as a shade tree. This oak tree has 4- to 8-inch-long, dark green leaves with seven to 11 waxy, spine-tipped lobes. The leaves turn vibrant red in autumn. The Northern red oak blooms in pale yellowish-green catkins at the same time the leaves emerge in spring, followed by round acorns that are ¾ to 1 inch long with flat, thick caps. The pin oak (Q. palustris) grows 60 to 70 feet tall with a 25- to 40-foot spread and a distinctly pyramidal canopy. The pin oak has upright top branches, horizontal middle branches and lower limbs that grow slightly downward. The leaves are divided into five lobes by deep sinuses, starting as medium-green in summer and turning copper or reddish in autumn. The pin oak tree produces ½-inch-long, round acorns with thin, saucer-shaped cups that have tight, small scales. The pin oak is known for its tolerance of wet soils and moderate flooding. As its name implies, the swamp white oak (Q. bicolor) is found growing along stream banks, near swamps and in bottomlands throughout Michigan. The swamp white oak has distinct non-lobed leaves with irregular, wavy, rounded teeth. The leaves are green on the upper surfaces and whitish with downy hairs on the undersides. 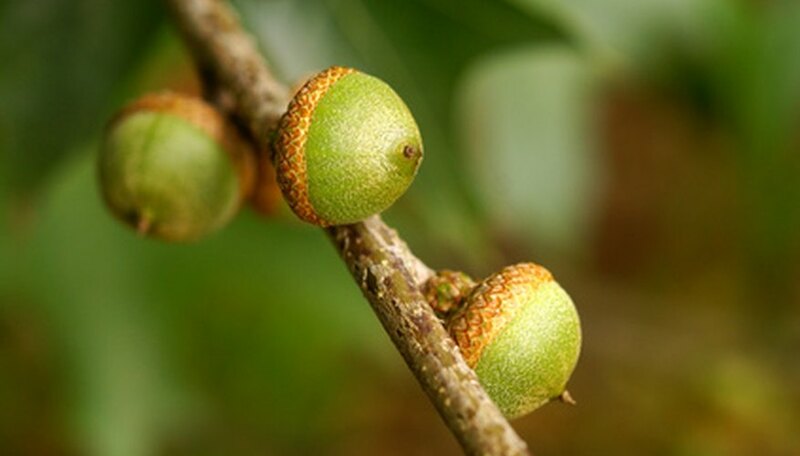 The swamp white oak grows 50 to 80 feet tall with a 1- to 3-foot diameter trunk and produces 1 ½- to 3-inch-long acorns that have cups without fringe. Swamp white oaks also have distinctive dark brown bark on their branches, which peels off and curls to reveal lighter-colored inner bark. The white oak (Q. alba) is found growing in full sun and moist, well-draining soils throughout Michigan. Growing 50 to 80 feet tall and wide, the white oak is a large, stately tree with a short, stocky trunk and large horizontal branches. The white oak’s canopy starts out pyramidal in shape, becoming more rounded with age. This oak tree’s leaves are oblong and widest toward the ends, usually growing 4 to 8 ½ inches in length. The leaves are reddish-pink when they first emerge in the spring, turning gray, dark-green and bluish-green in summer, then brownish to deep red or burgundy in autumn. The white oak’s ¾- to 1-inch-wide, tan-brown acorns have bowl-like caps with raised, warty scales and begin to fall off the tree in September until October.